Don't worry - I didn't suffer through unbearable heat and risk a heat stroke to get these photos. Oddly enough, the morning we woke up to take these pictures it was sunny, with little to no humidity and 80 degrees. In fact, this outfit felt perfect for that kind of weather. 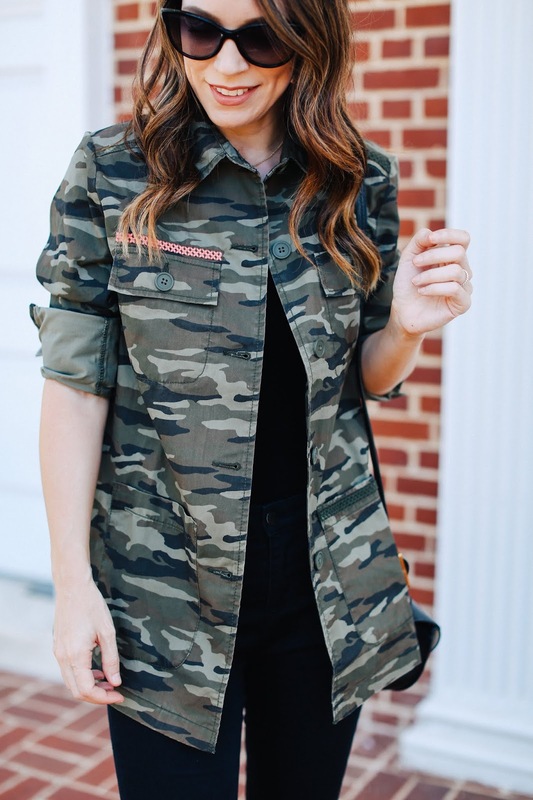 This camo jacket is incredibly lightweight and great for the warmer weather when worn over a tank top (like I am wearing here) or a sleeveless dress. However, come fall this will turn into the best transition piece. 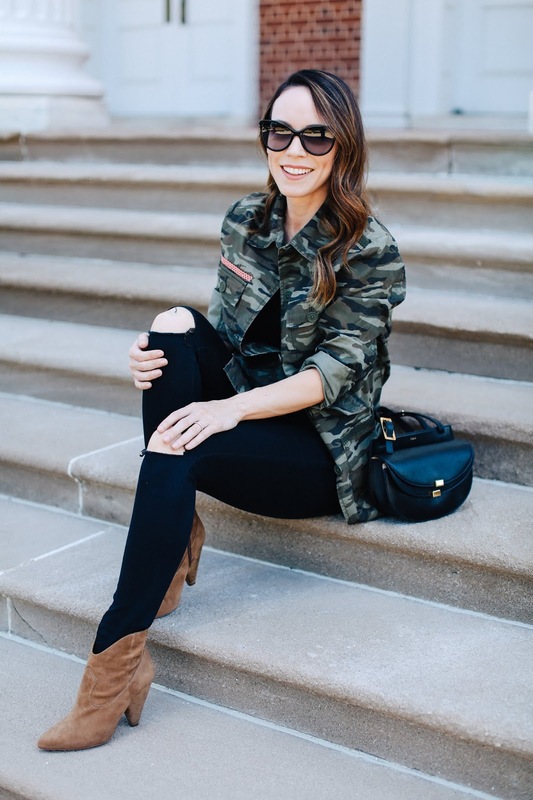 And out of all my Nordstrom sale purchases (see my hauls here, here and here), these boots along with these boots were my favorite buys. 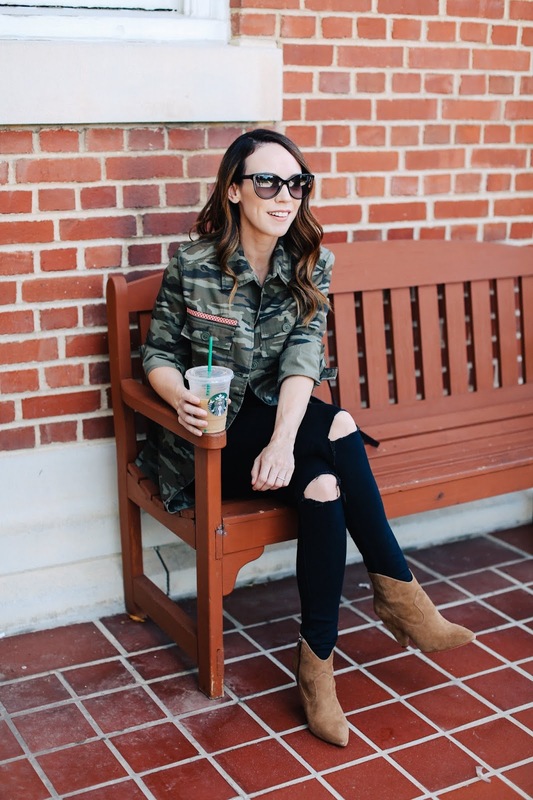 This pair that I'm wearing is a bit more casual and western looking and are something I would wear all year round (yes, I love ankle boots in the summer), while these are a bit more classic or better for only fall and winter. I decided to end this post with the recent books I've finished along with a few television series I watched straight through and enjoyed. 1. The Hypnotist's Love Story - I wasn't sure I would like this at first because the story wasn't moving fast enough for me, but the further I got into it the more I wanted to know how it would end. Ellen, a hypnotherapist, has only been on a few dates with Patrick but knows she is already falling for him. However, he comes with a bit of extra baggage in the form of an ex-girlfriend stalker. Most of Patrick's former dates have been scared off by this, but not Ellen. She is intrigued and curious about this dynamic. I personally couldn't stand the personality of the ex-girlfriend and she irritated me to no end throughout the book, but the author does a great job of letting the story unfold and ultimately I began to change my opinion of her as the chapters went by. Not a thriller, but definitely an interesting read. 2. The Dollhouse - After the period piece disaster that was The Wicked City, I was hesitant to read another period piece. Though this one was set up a lot like The Wicked City with two stories going simultaneously in different eras, I enjoyed this book much more. Rose Lewin is a journalist living with her boyfriend at a posh upper east side building in NYC that was once the Barbizon, a hotel for women in the 1950's. Rose hears rumors about a tragedy that unfolded at the hotel years ago and decides to interview some of the remaining tenants that were around during that time. The story takes some twists and turns and really kept me entertained until the very end. 3. The Perfect Mother - From what I read, this book is currently being made into a movie and after reading it, I can see why. This book was written to be made into a movie. Maybe not intentionally, but it will definitely translate well onto the big screen. The May Mothers is a mommy group in Brooklyn that meets weekly to bond, chat and discuss all things babies and motherhood. Unfortunately one of their members suffers a great tragedy and has her baby abducted one evening when she is out for a fun night with the May Mothers. The mothers in the group try to piece together what happened and do their own investigation separate from that of the NYPD. Secrets are revealed about the members which keeps the reader from determining exactly who took baby Midas. I definitely couldn't figure it out until the end, though I do think the "reveal" chapter where all comes to light is dragged on too long. But I assume it will be perfect for the movie adaptation. This was a definite winner and my favorite out of all 3 books! 1. Billions - Out of the two series I just finished, Billions was by far my favorite! In fact, it was my favorite series I have watched in a few months. I have started and stopped a million different shows recommended to me or ones that are highly buzzed about, but from the first episode I was hooked on Billions. It centers around Bobby Axelrod, a self-made billionaire that the District Attorney of NY is constantly trying to bring down. They both play dirty with their antics, but one of them is always ahead of the other. I just finished the last episode of Season 3 and sadly Season 4 won't be released for a while so I have to find another series to delve into as good as this one! 2. The Sinner - I have heard so many reviews and good things about this show, and while I did finish the entire season and enjoy it, it was only good not great. Jessica Biel murders a random man in broad daylight while at the beach with her family and seems to not have any explanation as to why. As the detective assigned to the case delves into her past, he helps her relive memories that explain her actions. Some scenes and episodes are a bit slow moving, but overall I think it is worth watching. For all my past book reviews, click here.